Autumn brings with it a plethora of opportunities for artistically placed pumpkins and other gourds, to liven up various porches and homesteads and make your sleepy little villa resemble a Norman Rockwell painting. Which makes the pumpkin-smashing vandalism of two hoodlums in Grants Pass, Oregon, especially shameful. 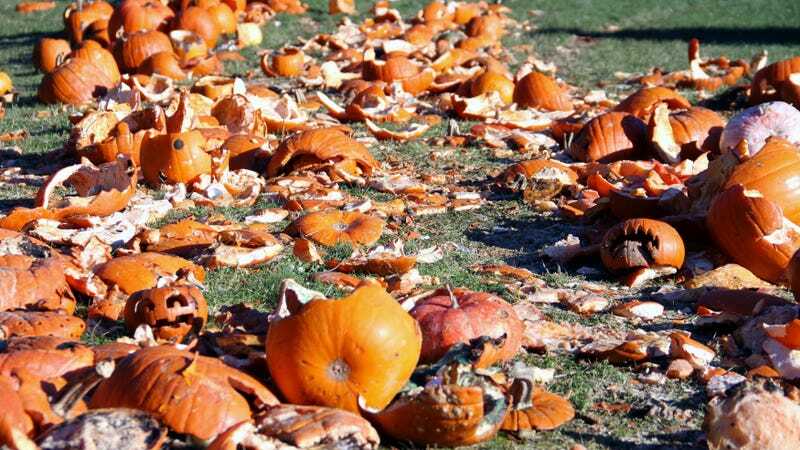 According to The Oregonian, two teenagers “face multiple counts of criminal mischief in connection with at least 50 vehicles vandalized and damaged between Oct. 7 and 23.” The two would grab pumpkins and then hurl them through car windows, adding an even more destructive element to the typical pumpkin-smashing vandalism. At least the two pilfered their pumpkins from outdoor supermarket displays and not from the homes of creative children, who would be even more devastated by the theft. Not that that’s much solace to the people who discovered a pulverized car window and a demolished pumpkin in their front seat. “Damages reported by victims have come in around $30,000 and continue to climb,” according to authorities. According to Lt. Misty English, “It sounds like there was probably alcohol involved and just a bunch of stupid decisions.” Among such decisions was the duo’s habit of always using the same, distinctive car: “The suspects may have gotten away with it too, had they not carried out the alleged wave of vandalism in a gold Buick with a large dent in one side, police say.” Nice Scooby-Doo reference, Oregonian! And it’s also nice to see that this crime wave has now ended, although the end of Halloween would have led to a considerable pumpkin shortage. Watch those holiday decorations, everybody.